Across North America, rural Native American and First Nations groups are establishing firmer control and autonomy over their land. This shift has been manifested in recent years through the establishment of tribally run environmental offices, through greater tribal oversight of mineral resources and industrial development, and in tribes taking a more active role in issues of water resources and water rights. This encouraging trend in political, economic and scientific autonomy is taking place, however, against the backdrop of serious underrepresentation of Native American students, and of all ethnic minorities, in geoscience undergraduate and graduate programs (see chart, page 16). In general, earth science expertise in Native communities is low. This underrepresentation of American Indian students in the earth sciences exists despite the fact that most Native cultures have a deep cultural bond with Earth and awareness of its processes. Why then do more American Indian students decide to pursue other fields at the college level, and why has scientific knowledge of earth processes failed to reach more deeply into Indian communities? Increasing numbers of tribal communities continue to struggle to find Native expertise for tribal water and environmental services offices. These communities need qualified individuals who can both understand and successfully manage scientific challenges while working within the values and structure of the community. Compounding these problems are generally low levels of education and science literacy among reservation populations. Data show that a smaller percentage of high school graduates in Native American, African American and Hispanic populations goes on to complete bachelor’s degrees than does the majority white population or the general U.S. population. These problems place the communities at a relative disadvantage in our increasingly technological society, as demands on natural resources continue to rise. Fear of science, or fear of scientific culture? 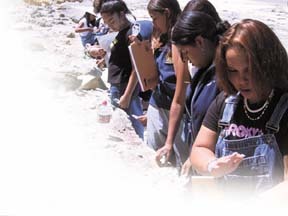 When Native American students take science and engineering classes in mainstream colleges and universities (meaning most public and private colleges and universities, which admit students of all backgrounds), they often find that the curricula and teaching styles conflict both with how they were taught to understand the world in their home cultures, and how they have been taught to learn — in terms of the proper styles of interaction with instructors, classroom behavior, standards for achievement, etc. To successfully attract and retain these students, earth science departments in mainstream institutions must create, within or around their standard curricula, a learning environment that will help students become acculturated, not assimilated, into the culture of geoscience. Acculturation is the selective incorporation of new learning and experiences and the modification of currently held ideas and customs. Assimilation, on the other hand, is an outright attempt at replacing currently held beliefs, learning and customs with the culture and findings of science. The former is driven by the student, the latter by the instructor and curriculum. Acculturation works much better for Native American students, who may already experience trepidation about science and who may not wish to compromise their indigenous, traditional ways of thinking about the natural world. But indigenous teachings can coexist comfortably with — and even enhance — geoscientific knowledge. Similarly, students who have deeply held religious beliefs can also become good scientists once they come to see how, when and where these separate ways of knowing can be best applied. Scattered across North America are a significant number of loosely coordinated, locally focused curriculum development and program reform efforts aimed at increasing the number of American Indian students entering the geosciences. Many of these programs are based in tribal colleges, others in universities and community colleges. All have in common a close collaboration of tribal community and education leaders with academic geoscientists, working together to identify and lower the barriers Native students face to enter the geosciences — and to identify what kinds of geoscience expertise reservation communities need most. Tribal colleges and mainstream academic institutions face challenges in creating and maintaining these partnerships. But, through education, the geoscience community has many opportunities to make lasting, positive influences on the lives of American Indian communities. Beginning with the Diné people in 1968, Native American nations have chartered 32 tribal colleges, their own accredited institutions of higher learning. These colleges, affiliated through the American Indian Higher Education Consortium, have dual missions: to prepare Native students for careers and advanced studies, and to preserve and teach traditional cultures and languages. Tribal colleges are on the frontier of minority education, but many of them lack basic infrastructure and personnel resources. They have fewer resources than other institutions that serve students from both minority and majority populations, and far fewer than mainstream universities and colleges. Many can afford only sparse course offerings in science, and most are limited to biology and chemistry. Tribal colleges that do teach geoscience — College of the Menominee Nation in Wisconsin, Southwestern Indian Polytechnic Institute in New Mexico, Salish Kootenai College in Montana, and Northwest Indian College in Washington — typically incorporate courses in physical and environmental geology, soil science and hydrology within interdisciplinary programs in the management of tribal natural resources and environmental quality. They do not offer geoscience degrees. This philosophy is in part a response to the career opportunities and interests in their communities, and in part because tribal colleges generally house small, interdisciplinary departments of science and technology. With a mandate to promote the study and teaching of indigenous languages and ways of knowing (that is, the epistemology of how we come to understand things about the world), some tribal colleges have begun to utilize Native American ethnoscience. Ethnoscience is a broad term describing all efforts to critically examine indigenous knowledge from all Native groups worldwide for scientific knowledge of geology, biology, astronomy, etc. Native cultures have made careful observations of the natural world for thousands of years, and it is important to validate and incorporate their terminology, place histories and other empirical scientific knowledge as integral components of science curricula that will effectively educate and inspire Native students to pursue scientific careers. In turn, the students who become scientists can help their sovereign Native communities develop their own methods for managing their land and resources and for dealing with environmental issues. This combination of indigenous ideas with scientific concepts is indigenous geoscience education. For example, the Haskell Indian Nations University in Kansas, in a partnership with the U.S. Geological Survey and other academic institutions, has developed geoscience curriculum materials that integrate Native knowledge and relevant environmental case studies. The curriculum includes a video, Mother Earth’s Stories, that illustrates geological features, phenomena and hazards. It was filmed across Indian country, from the Great Plains to Alaska, and is narrated mostly by Native Americans. Since the early 1990s, the geological and environmental sciences program at Diné College has been evolving into an indigenous Diné educational model. The gradual redesign of a mainstream, two-year academic program has been guided by Diné scholars and elders within the college community, and influenced by seminal work in cross-cultural science education by Gregory Cajete of Santa Clara Pueblo and by the Alaska Rural Systemic Initiative. The work has received funding from the National Science Foundation, Department of Energy and U.S. Geological Survey. Indigenous geoscience teaching at Diné College is place-based and culturally responsive: Course content emphasizes the features and phenomena of the Colorado Plateau, and teaching methods are concordant with, if not modeled directly on, traditional Diné ideas. The curriculum engages students in constructivist (experience-based teaching and learning, as opposed to lecture-oriented teaching) field and laboratory activities that are based on a Diné model of teaching and learning. The spectacular natural environment of the Colorado Plateau and Southern Rockies permeates Diné life: four sacred mountains define the boundaries of the traditional homeland, Diné bikéyah; songs invoke landforms, groundwater and climate; and most localities were named for distinctive geological, hydrological or botanical features. Many students come to Diné College having spent their youth on the land herding livestock or farming. They carry a deep sense of place: A familiarity with rocks, landforms and desert climate that is almost certainly unique among 21st century undergraduates. The college’s eight campuses, spread across the vast Navajo Nation, are in the midst of some of the world’s most renowned strata and landforms, classic National Parks and Monuments, and active coal, oil and natural gas operations. On many sites, unregulated resource extraction, such as the Cold War-era mining and milling of uranium, has left a legacy of water and soil contamination with which Navajo and federal agencies continue to wrestle. The students study and integrate ethnogeologic concepts. For example, they learn about the role of coupled endogenic-exogenic processes — termed Earth-Sky in the Diné model — and constructive-destructive processes — termed female-male — in the evolution of geologic materials and landforms. Through case studies, they understand how Colorado Plateau physiography, climate, geology and resources have influenced Navajo history and lifeways, traditional ways of living within communities and the natural world. Above all, the curriculum respects the integrity of the Diné culture. Certain localities may be culturally sensitive, and these sensitivities must be considered in planning field trips. For example, traditional stories relating to landscape features may be used to enrich a class discussion, but only during the winter months, following Navajo tradition, and never in a deprecating manner. Most universities and colleges do not enjoy the close association with Native populations and cultures basic to a tribal college. Universities are generally located in suburban or urban areas, far from reservation communities, and serve students of all cultural, ethnic and academic backgrounds. Community colleges are in a similar situation, but have the advantage of being smaller and more responsive to the needs of their local populations. Some community colleges can function as de facto tribal colleges if they are near reservation populations. Regardless of their locations, all universities and colleges have the common challenge of building programs and campus cultures that will attract and retain American Indian students. Tribal colleges and their curricula are created out of tribal cultures and so offer a less threatening or foreign environment for young students new to the college experience. But at large universities and many community colleges, a young Native student can easily get lost in the mainstream culture and the “one size fits all” curricula. And moving from a rural high school or community college environment to an urban university such as San Diego State University, which has more then 30,000 students, can be intimidating for any student. The end result is that many Native American students may attempt one or two years in college, but eventually feel they do not belong and leave. They often complete community college programs, but rarely continue to earn four-year degrees. Universities have the infrastructure and resources to address many of these problems by providing curricular, programmatic and financial support, such as an early academic outreach program for Native American students. Programs designed to introduce high school and community college students to the university environment and academic research are numerous, and a few outstanding examples already exist nationwide in the geosciences, with many more programs gradually coming online. The National Science Foundation has also taken strides to help create programs that introduce minority students to the geosciences. Most Native students also face hardships in affording a college education and living off the reservation. Fortunately, these students have a number of national scholarship and fellowship programs available, as well as specific programs in the geosciences sponsored by the American Geological Institute and other professional societies. A scholarship can often mean the difference between finishing a degree or not. Universities struggle to create the same basic ingredients that are inherent in a tribal college’s mission, especially building a learning environment that is comfortable for Indian students, creating a sense of community for those students within large institutions, and designing curricular modules or supplemental programs that accommodate Native learning styles and honor Native students’ traditional knowledge. Of course, creating such curricula is not easy, especially within a research university. But the geosciences have an intrinsic advantage because they encompass hands-on and, field-based learning and cyclical, systems-oriented thinking about earth processes. These ideas match the basic philosophies underlying many tribal cultures. The College of Sciences and the College of Education at San Diego State University host a joint research center dedicated to math and science education. This focus of expertise, as well as the institutional recognition for educational programs, gives the university an advantage in implementing programs for Native American students. Such recognition in a research university is a key ingredient for success. Another critical ingredient for success is direct and full collaboration with Native American educators in reservation communities. At San Diego State, the authors have formed the San Diego Native American Earth Science Alliance, collaborating with the University of California at San Diego and the tribal learning centers of five tightly knit San Diego county reservations. The partnership seeks to build field, classroom and Web-based earth and environmental science programs for their communities. Together, these introductory programs are the first step toward building interest in and understanding of the geosciences in those communities. Collaborating with local community colleges near reservations is also critical, and the authors have joined with Palomar College to formalize mentoring and transfer pathways for students from our partner reservations, providing well-coordinated classes and teams of contact people at both institutions. Other partnership programs include the Native Americans in Marine and Space Sciences at Oregon State University, the integrated environmental and physical science programs at Humboldt State University, and others around the continent. The challenge remains for individual universities and geoscience departments to tailor their programs to their environments and to the needs of the Native Americans in their regions, and to devote faculty and departmental resources to help students successfully make the leap to university work. Sustainability of such programs is a challenge. But more federal agencies are offering funding to start programs that aid minorities. Also, once the programs are successful, university administrators are generally amenable to institutionalizing summer programs, new courses and scholarships. With universities and tribal communities collaborating, and with institutions attempting and running programs for Native American students, geoscientists stand a good chance of attracting these students into our science. The ultimate result will be more scientific and intellectual diversity for the geoscience community, as well as security and scientific autonomy for the Native peoples of North America. Semken teaches in the Division of Math, Science, and Technology at Diné College, Navajo Nation, Shiprock, N.M.